Mehndi is traditionally applied on the palms and on the back side of the hand. 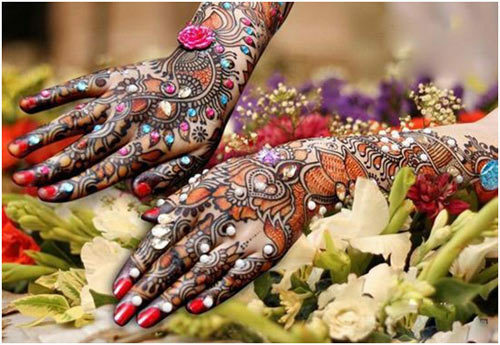 The mehndi designs for back hands are usually bigger and not so intricate like the mehndi designs on the palms, so that they are prominently visible. 1. 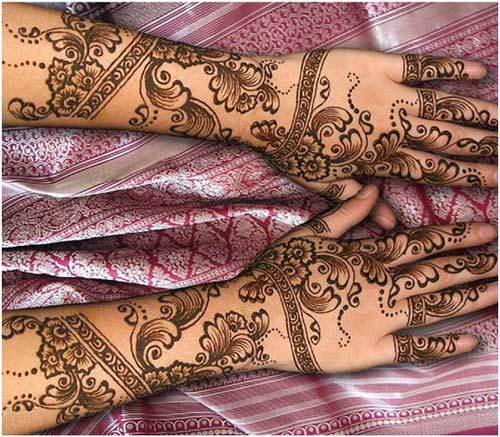 This typical choice of the back hand mehndi designs is drawn using intricate leaf shaped motifs. The main string of leaves runs down only through the middle finger, so that rings and other accessories can be easily worn on the other fingers without hiding the mehndi design. The tips of the fingers are beautifully decorated with miniature designs. 2. 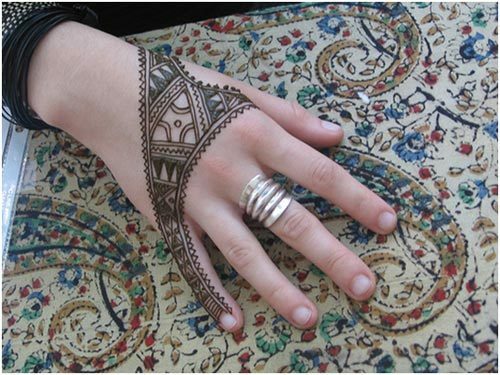 This one of the mehndi designs for back hand is the perfect example of how henna can be used as an accessory too. It starts from the middle finger on both the hands and runs down the back of the hand till the wrist. This design completely resembles the jewellery where the ring is attached to the finger and it covers the back of the hand. The pattern is kept very traditional with flower motifs and bead works. 3. A very modern twist to the traditional mehndi design. The pattern resembles Tribal block design which runs down through the little finger. This design looks chic and trendy and can be sported for any casual event. 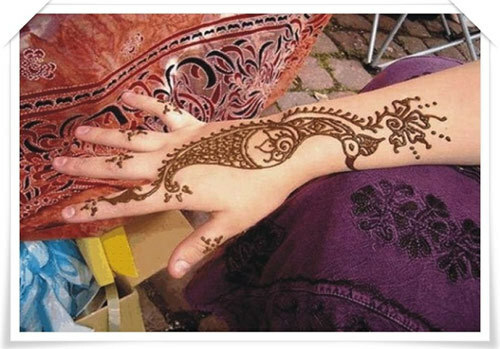 One can also use it as the henna tattoo without applying mehndi on the palm. 4. 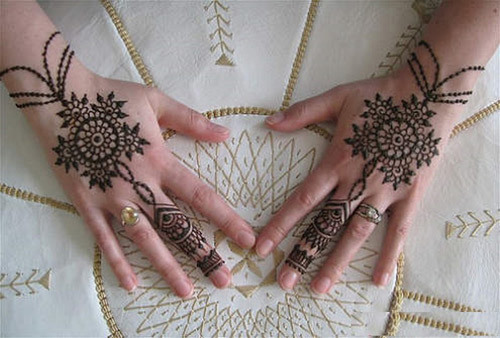 This Arabic mehendi design can be worn by both the bride and her friends. The design consists of only flowers, leaves and creepers pattern. Adequate amount of space is left between two patterns, giving it a very non-messy look. 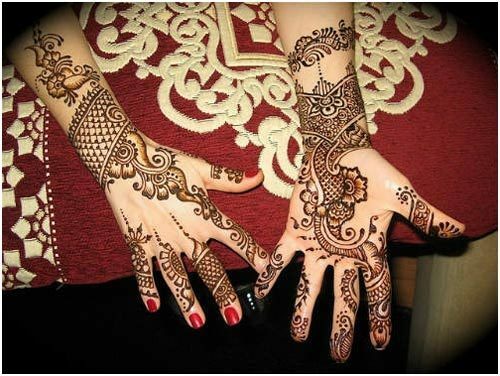 The mehndi design on the palm and the back of hand are almost identical to each other. 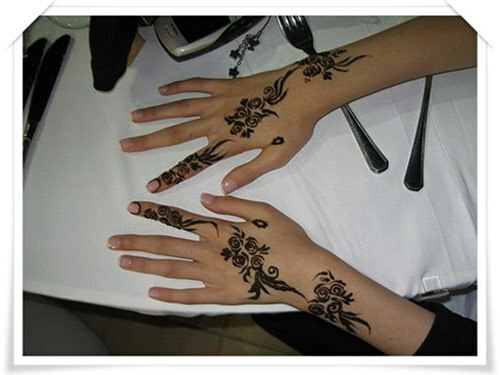 Black mehndi has been used to enhance the borders and regular mehndi has been used to fill up the entire design. 5. 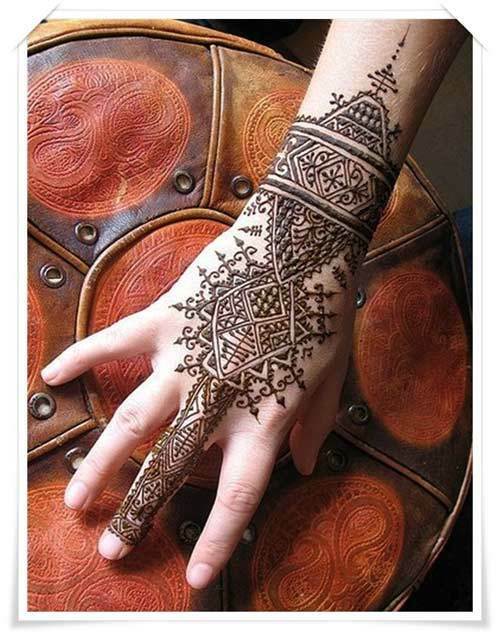 This is an example of abstract pattern for back hand mehndi design. Emphasis is on the centre of the back hand where geometrical shapes have been used to create the pattern. You won’t find the use of traditional flower and leaf motifs, thus this design turns out to be unique yet elegant. 6. This Arabic mehndi design is been quite popular and you will see it everywhere. The pattern is similar on both the hands extending till half of arms. Heavy use of decorated leaves and creepers with adequate spacing makes the design look non-messy and elegant. This design is very suitable for brides. 7. Are you planning to ink a new tattoo? Then try this one of the mehndi designs for back hand that looks like a henna tattoo without undergoing the pain of needles. This mehndi design resembles modern day Arabic tattoo with rose buds and leaves motifs. Three similar patterns are drawn on the entire hand, spaced properly which makes the design appealing and stand out. 8. Animal or human figures are very common in Indian mehendi design. The above design consists of a peacock which covers the entire hand, but intricate details are not added which gives it a very clean and refined look. Miniature patterns have been drawn on all the fingers, keeping the overall look simple yet stylish. 9. Yet another arabic mehndi design which is one of most common patterns nowadays. Bold flower designs are used to fill up the hand, which are easy to design and easy to apply. 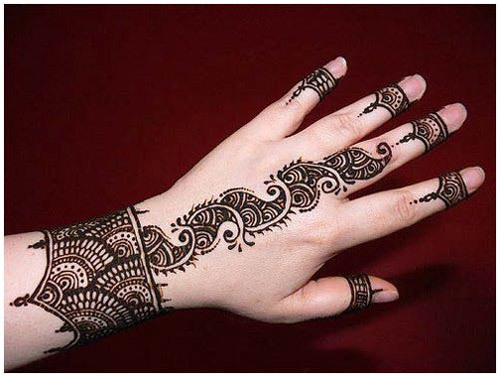 One can use black mehndi to draw the outline and normal henna to fill up the design. This particular design can be applied by any group of women, old or young and on any occasion. 10. This heavy studded mehndi is suitable only for the bride. 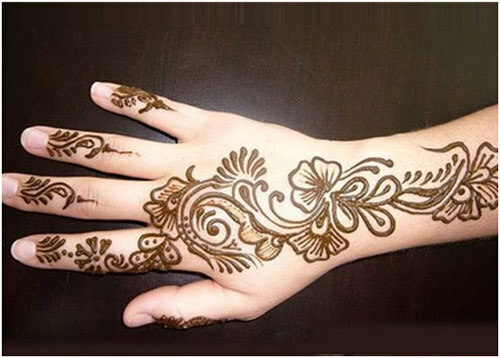 Use of different kinds of mehndi like the black mehndi, red mehndi and normal henna can be seen in this design. Small and big stones have been placed beautifully to enhance the design. As you can see, small pearls have also been added over the tips of the fingers. Try this unique design if you want to add a bit of uniqueness to your regular mehndi. Do try these lovely yet simple mehndi designs for back hand and do not forget to post in your pictures below. Till then take care and keep it stylish!!!!! !